A new European Union project aimed at actively involving young people in Serbia and increasing their employment was presented today in Belgrade. Organizations at the national and local level will receive non-returnable assistance (grants) in order to enable young people to more actively participate in the labour market, receive employment, improve their knowledge and skills, gain valuable work experience, learn entrepreneurial skills or start their own business. More than 3,500 young people will have an opportunity to become more actively involved in the labour market, receive employment, improve their knowledge and skills, gain work experience, entrepreneurial skills or start their own business. Particular focus is on young people who are less likely to participate in the labour market, such as young people without qualifications or under-qualified youth, unemployed youth and young people from vulnerable social groups (youth with disabilities, developmental disorders, Roma, youth based in rural areas, etc. ), young people without an education or lacking some form of training and certification, and young beneficiaries of social assistance programs or long-term unemployed youth. The European Union’s Youth Employability and Active Inclusion project is managed by the Ministry of Finance – Department for Contracting and Financing of EU Funded Projects, while the institutional beneficiaries of the project include the Ministry of Labour, Employment, Veterans and Social Affairs and the Ministry of Youth and Sports. 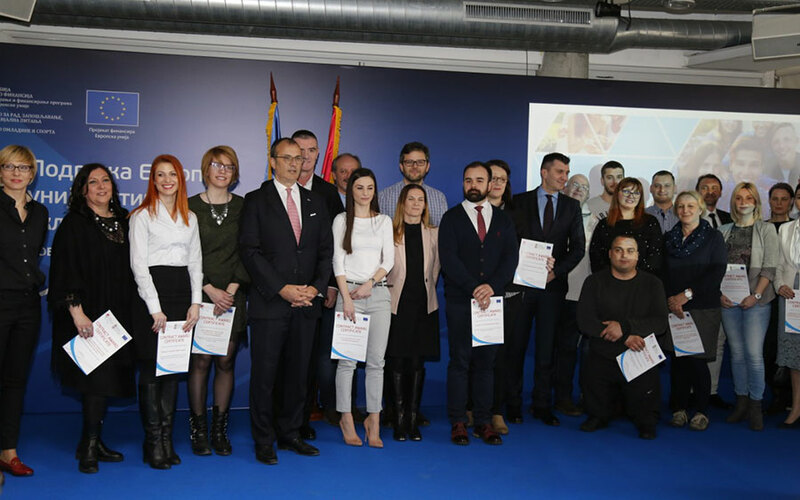 The Head of the EU Delegation to Serbia, Ambassador Sem Fabrizi, emphasized that the first priority of all should be to ensure that Serbia is a place where young people can progress and achieve their potential. “This project is a very good example as it aims to ensure greater social inclusion of young people through increasing employment, youth activities, work experience and entrepreneurial practices among young people,” said Fabrizi. 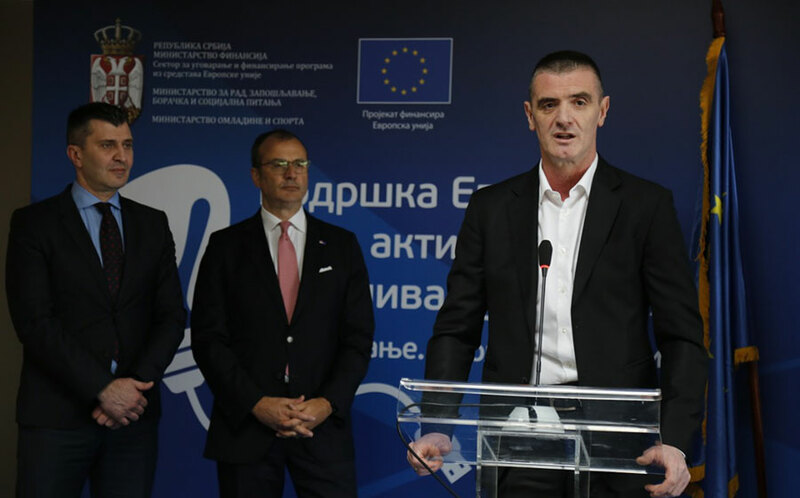 The European Union and the Government of the Republic of Serbia have donated 4.1 million euros for 24 contracts dealing with youth projects, while an additional 600,000 euros has been provided by the EU for technical assistance to line ministries, as well as for grant beneficiaries to implement their projects in an effective and efficient manner in accordance with EU rules and regulations. The Minister of Labour, Employment, Veteran and Social Policy Zoran Djordjevic said that active inclusion of young people in society is one of the priorities of the Government of the Republic of Serbia. “Through this project the Ministry, together with the European Union, has an opportunity to increase the scope and quality of services at the local level both in terms of education and employment, as well as in innovative practices and models for active inclusion of youth,” stated the Minister. The State Secretary of the Ministry of Youth and Sports Predrag Perunicic highlighted the importance of cross-sector cooperation. “These 24 projects that will be implemented throughout Serbia are a clear indication that the cooperation between several different sectors and actors, primarily at the local level, is necessary if we want to improve employability, acquire practical skills, work experience and nurture an entrepreneurial spirit among young people,” said Perunicic. Assistant Minister of Finance Marko Jovanovic pointed out that the Ministry of Finance achieved a high absorption rate of over 90% of allocated funds through the IPA 2014 program, through which this grant scheme was financed. 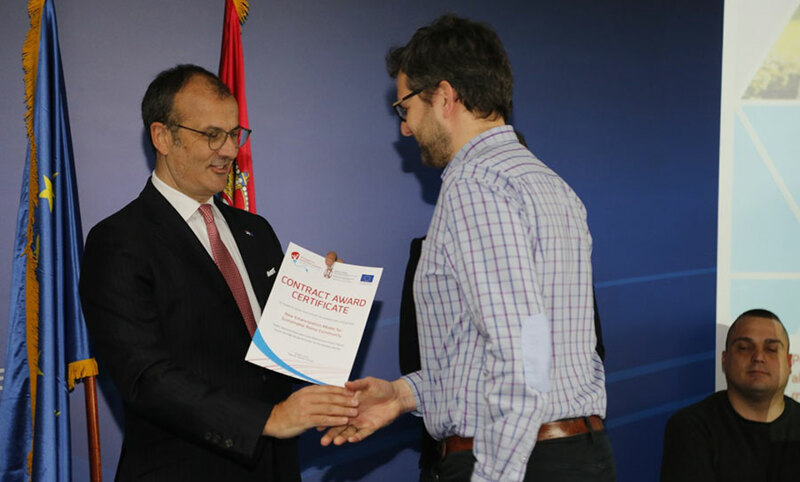 “We hope that these projects will contribute to the overall readiness of institutions at the national and local level for innovative development and management of measures for active inclusion of young people and, consequently, more effective use of financial assistance funds from the European Union,” he said. Through EU investment in technical assistance is expected strengthened capacity of institutions and organizations at the local level, establishment of better cooperation between institutions to better respond to the needs of young people, but also to increase the scope and quality of their services. Additional assistance will also be provided to line ministries in order to support advancements to employment policies and active inclusion based on the results and lessons learned through project implementation.